Most citizen's don't particularly enjoy paying taxes, because nobody like parting with their hard earned money. Therefore, the tax authorities should try to make the process of filing a tax return as painless as possible. In fairness the Irish tax authorities have done a good job of making the paper forms and associated documentation quite easy for the lay person to understand, so when I recently started using the revenue on-line service I was expecting that it would be equally simple to use. Unfortunately I was very disappointed and found it very frustrating. This service was originally developed to be used by tax professionals who spend most of their working life dealing with tax issues and is it is optimised for this type of user. It was only in recent years that they opened the system to "normal taxpayers" and they have been surprised that the system has not proved more popular. However, from my experience (which I will describe below) I can totally understand why people are sticking with the much more user friendly paper based system. I understand why the tax authorities would prefer people to use the on-line system, but they will have to adapt the system significantly if they hope that a large section of the population will be willing to switch. The first hurdle that users must battle with is the registration process. They need to be careful to avoid fraudulent registrations, but the system they devised is almost guaranteed to take about over a week to complete and hence relatively few normal taxpayers will have enough patience to do it properly. When you initially register on their web site you will in a normal enough looking web site registration form. However, when you complete this form you are not really registered you have simply applied for a ROS Access Number (RAN) which is required to progress to the next stage. For security reasons this RAN is printed on a physical piece of paper and then posted to your home address. This is done to ensure that the person applying for access to your tax records is really you (or at least has access to post delivered to your home). However, the need to print and post the document ensures that there is a delay of several days before you can move to the next steps which is to apply for your Digital Certificate. When you apply for the certificate, they don't issue it to you straight away, but instead they generate an access password which must be printed out and posted to you. This second postal interaction doesn't really increase security, because anyone who can intercept the first letter will probably be equally able to intercept the second. In any case, you must wait until your password arrives in the post before you can retrieve your Digital Certificate and begin using the system. Although this system seems quite straight forward, the delay involved effectively stopped me from using the system the first two years I tried. Like many citizens, I normally only need to interact with the tax system once per year when filing a tax return. As soon as I have collected all of the necessary information to complete a return, I like to complete the return straight away so that I can then relax and forget about the tax system for the next year. The first year I decided to try filing my tax return on-line I was full of enthusiasm. When I had all of my documents ready to file a tax return, I was disappointed, but not surprised that I had to wait for the first postal step. However, when the letter arrived with the revenue access number I was frustrated that I could not complete the form straight away and so I completed the return on paper before the second letter arrived. The next time I thought about the ROS system was when it was time to file a return for the following year. I found the old letter in my file with the access code to retrieve my certificate. Unfortunately when I tried using it I was told that the password had expired. Therefore I went back to using the paper system for another year. The third year I decided that I should be a little more patient and so I completed the registration system from scratch. This time I encountered technical issues when I went to retrieve my password. The system gave me the unhelpful message "Something has gone wrong. Please contact the ROS HelpDesk". In fairness, the people operating the help desk were very responsive and did their best to help. However, it was hard for them to diagnose the cause of the problem from this generic message. Their first suggestion was that the browser I was using might not be a supported one. They supplied me with a list of supported browser versions. I tried three of the browsers on their list but all of them gave me the exact same error message. Unfortunately when I tried accessing the system from the windows system it was still telling me "something has gone wrong". When I told this to the help desk, their next suggestion was to try updating the version of Java installed on the machine. Luckily this suggestion worked and after a delay of 3 weeks I was finally able to use the ROS system. Since I am using a virtual machine to access the tax system, I should be able to keep a backup of my exact environment and use this to access the site next year. However, many users will be constantly updating their environment and it is likely that they will encounter fresh issues each year. If they abandoned the use of private digital certificates it would simplify the registration process and also allow them to be much more fussy about the details of the software used to access them. Most banks think that normal SSL encryption is secure enough for their web interfaces, so surely the revenue site should go along with this concensus. It would be helpful if the web site gave more helpful error messages. As a software developer I appreciate that it can be difficult to generate meaningful error messages, but surely they could do better than the simple "something has gone wrong". It would also make life easier if they added an option to summarise the user's environment and email it to the help desk people so that they could see all of the relevant details at one glance. The help desk people were simply guessing in the dark about what might be the cause of my problem, because there was no better way for them to diagnose the problem. In summary the process the system seems to be quite fussy about the computer environment users have when trying to access the site. Tax professionals who spend quite a bit of time accessing the ROS site will probably be willing to install specific versions of software to enable them to access the site. However, the majority of citizens who only want to access the site once per year will be much less willing and hence will probably stick with the paper system unless it is made easier. I am both a fan of exercise and of technology. Therefore, whenever I run or cycle, I like to use an application that leverages the GPS functionality of my phone to keep a track of exactly where I have been going and how fast I have been running/cycling etc. I have been a long time happy user of the MyTracks application from Google. Recently I converted to using RunKeeper because after watching a presentation on the benefits of sociability in training apps, I wanted to use an app which was more sociable. Ironically I am now switching back again because RunKeeper is too social. In terms of core functionality, the tow applications are similar. MyTracks application is a typical Google product which tends to appeal to most geeks like myself. It doesn't have lots of features, but it does one thing and it does it very well. The one thing it does is use the sensors in the phone to track exactly where you went. It does not even assume that you are using it for tracking fitness related activities - for example I first started using MyTracks, I was walking around neighbourhoods and tracking the location of roads so that I could update OpenStreetMap. If you are using MyTracks for tracking your training you can simply select the menu item "send to Google" each time you complete an activity and Google will automatically create a Google Docs spreadsheet with all the details of your training statistics without any effort on your behalf. The level of detail in the data is more than would be collected by a professional athlete, but there are no fancy graphs or charts. However, it is easy to use that application of your choice to create any chart you want. Likewise they don't attempt to implement any sociability features, but they make it easy to export your data to any other application if this is what you want to do. 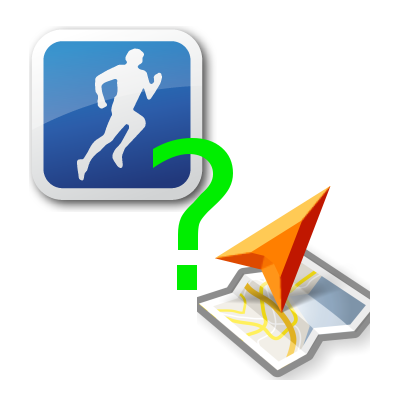 For example, I occasionally use the excellent Tracks2Miles application written by Ben Hardill to send my training data to the DailyMile site so that I can share information with friends. I said that MyTracks makes no direct attempt at being sociable with your training data, but the makers of RunKeeper seem to assume that the only reason you are collecting data is so that you can share it on their site. If these applications were real people, I would compare MyTracks with a work colleague who believes that there is no need for social chit chat at work. In contrast RunKeeper is more like one of those annoying cheerleader types who keeps offering encouragement (whether you want it or not). Initially this encouragement is great, but after a while it begins to get on my nerves. The only place that the RunKeeper application will store data is on their site. Of course it is possible to later export the data to share it elsewhere, but not many people will go to this trouble. I suppose this is a natural choice for them, but I personally prefer the Google approach of making it easy to share data directly from their application to wherever you want. The charts on the RunKeeper site are much more visually appealing than the plan text spreadsheet created by MyTracks, but Google actually makes the raw data easier to get at. The default settings on RunKeeper is to share every piece of data with everyone. Of course it is possible to change these settings, but it would be easy for a shy person to be embarrassed by accidentally over sharing. The RunKeeper site will constantly send you congratulatory emails and/or post to your Facebook profile when you achieve significant training milestones. I suppose this is probably viewed as a good feature by some people, but personally I found it to be patronizing when I first started using RunKeeper and went on a fairly short slow run to try it out. They were gushing about how it was my longest run ever and a personal best (of course it was my longest ever run from their point of view). Choosing an application, is somewhat like picking whom to be friendly with - there is no one choice which is right for everyone. Both of these applications are very good, but I think it is important to pick an application that its a good match for your personality. This is why I am sticking with MyTracks (for now).